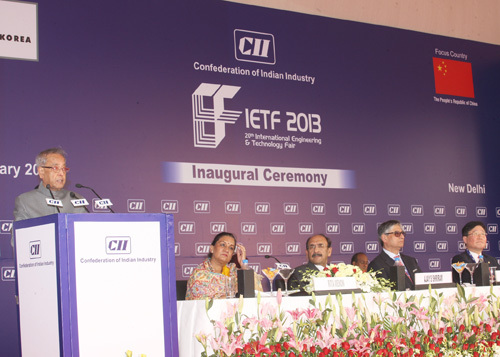 It is indeed a happy occasion for me to join you at the Inaugural Ceremony of the twentieth edition of the biennial International Engineering and Technology Fair (IETF), being organized by the Confederation of Indian Industry (CII). Over the last four decades, IETF has transformed from being a small event for the engineering industry to one of the largest and most prestigious exhibitions in Asia. I commend CII for guiding the course of this event, which has helped position India firmly on the global engineering map. With participation by over 350 national and international companies and conduct of 10 sector-focused fairs in this edition of IETF, I am confident that it will continue to build strategic business partnership, drive innovation and create synergy. I am happy to note that Republic of Korea is the partner country for this edition. India and Republic of Korea enjoy close and warm relations that extend to multiple dimensions. Economic and commercial cooperation between our countries is strong given that leading Korean companies are major participants in our economy. Korean companies have built immense brand recall in the Indian market for the high quality and standards of their products. I am told that 72 Korean companies are participating in this exhibition to showcase products from a range of sectors such as tools and machinery, chemicals and transport. It is gratifying to know that China is the focus country in this event. China’s prowess in engineering and technology is well-known and its participation will only strengthen the linkages between Indian and Chinese engineering enterprises. The IETF has been organized at a time when the world is beginning to emerge from the second-round impact of the global economic crisis. India too has felt the repercussions of global slowdown. Though our economic growth has recently declined somewhat, I am confident that we will be able to bring the deceleration to a halt and revert to the 8 per cent plus growth levels that we attained many times in the past. The underlying growth impetus remains strong due to continued rise in per capita incomes, expanding middle-class consumers and a young and energetic workforce. I believe that stronger efforts from all stakeholders collectively can build on this trend to secure a faster growth as the global economy revives. Engineering is among India’s leading manufacturing sectors. It draws sustenance from India’s formidable base of heavy and capital goods industries, a large knowledge pool, and competitive cost structures. Our thrust on infrastructure development and industrial production provide further fillip to the sector, creating high demand for products across the engineering spectrum from machinery and automotives to power equipment, electronics, and advanced manufacturing. Through the National Manufacturing Policy 2011, the government has initiated an umbrella mechanism to promote manufacturing industries under dedicated National Investment and Manufacturing Zones. These Zones would bring together state-of-the-art infrastructure, latest technology, skill development facilities, and rapid connectivity to emerge as hubs of manufacturing growth. Large amount of investment is envisaged in key sectors such as power, transportation and urban development, a considerable portion of which is expected to come from the private sector. This will create opportunity for businesses operating in the engineering sector. For that, companies would need to address productivity and competitiveness. People should be at the heart of the engineering effort, reaching out to human resources, consumers and vendors. The contribution of manufacturing to total employment in India is about 11 per cent, which is lower than that of the emerging countries where the share of manufacturing in total employment is between 15 to 30 per cent. The National Manufacturing Policy, 2011 has envisaged the creation of 100 million additional jobs in the manufacturing sector by 2025. To make Indian Industry productive and competitive, we must enhance our capabilities on many fronts, primarily human skill, hardware technology, and knowledge base. The Micro, Small and Medium Enterprises (MSME) sector has come to occupy an important position in our economy. It contributes about 45 per cent of the manufacturing output and about 40 per cent of total exports of our country. In over 29 million MSME units, about 69 million persons are employed. A dynamic entrepreneurship is providing a new energy and drive to the MSME sector. We need to strongly support engineering MSME units which are seedbeds of innovation. Their rising participation in the engineering value chain would impart a new dynamism to the engineering sector. I am told that the IETF has dedicated platforms for showcasing technologies and advances in these sectors. I look forward to seeing some of the exciting new technologies and products on display. Let me conclude by again congratulating CII for organizing this event, bringing the engineering world together with the Indian industry. I wish you all a very productive participation.